Dogs communicate a great deal to each other with body language. If we learn this language we will understand what our dog is saying and feeling. I posted some videos on dog body language in a previous post (March 16, 2013) showing playful and aggressive body postures. What I want to share with you here are the various body postures dogs use to calm themselves and other dogs when they are feeling stressed. Turid Rugaas is an expert on canine body language and has done much work with fearful dogs using what she calls “calming signals”. Moving Slowly – A dog intending to use signals, upon seeing another dog in the distance, will start to move slowly. This exaggerated slow motion is a calming signal, and one which can be used early and effectively when meeting. 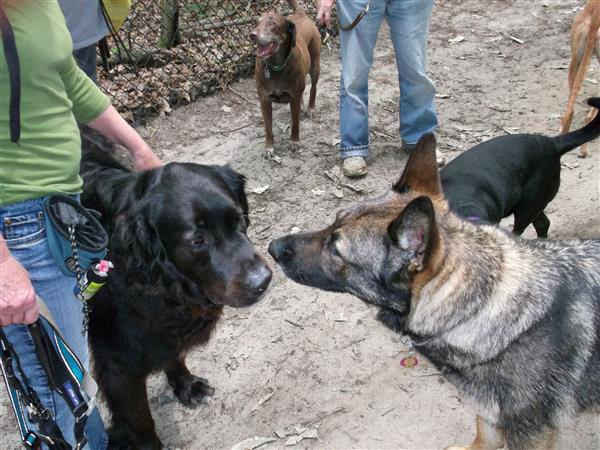 Moving in an arc – Rarely upon first meetings will dogs approach each other nose to nose. Only dogs which are very sure of the outcome of a situation will attempt to meet head on. More frequently dogs approach each other in curving lines, walk beyond each other’s nose to sniff rear ends while standing side to side. Sniffing the ground – Dogs use their noses to explore their environment, but at times sniffing seems to have a different significance. Owners have attributed out of context sniffing to lack of concentration or stalling. Some say it’s a displacement activity. Turid categorizes sniffing during times of stress as a calming signal. Sitting, lying – These positions are probably the most graphic calming signals of all. You can see them being used in active play sessions. A dog will spontaneously drop when things get out of control. Lip licking – This quick little flick of the tongue is language which often goes unnoticed because it is shadowed by more overt signals. It is yet another way for a dog to convey the same message, for everybody to calm down. Blinking, averting eyes, turning away – When a dog approaches another, it’s a very interesting moment in time for those individuals. Why then, do we see dogs looking away, exaggerating an eye blink or turning their heads away from approaching dogs? Is it disinterest, distraction or a calming signal? Yawning – Perhaps the most intriguing of all signals is yawning. Go here to read the entire article posted in CANINE COMMUNICATION Calming Signals. In a future post I would like to explore more about what happens when dogs do not understand or read another dog’s body language – and why they don’t. There is so much we as guardians and teachers need to know to help our dogs live the best life and be the best dog they can be! The more we know about how our dogs think, learn and feel the better our lives together will be. Leaving the URL for your previous post here – https://mypositivedogtrainingblog.com/2013/03/26/guide-to-dog-body-language/ – totally great videos to check out. I definitely learnt something, particularly for the 2nd video on dog play, since Donna does not have much chance to play with other dogs. 🙂 Thanks for sharing!